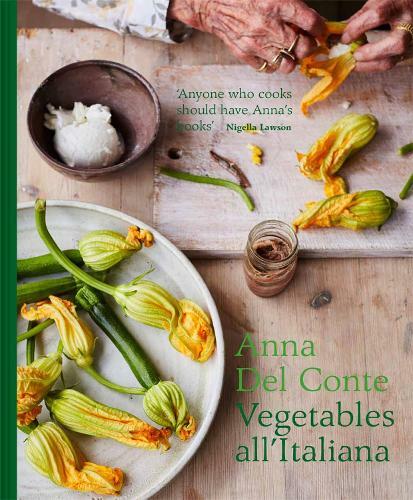 Described by Nigella Lawson as the ‘instrumental force in leading [the English] beyond the land of spag bol’, iconic Italian chef Anna del Conte shares her favourite vegetable recipes. Organized in an A-Z format from asparago to zucchina, Anna presents classic dishes alongside her own personalised recipes. These range from classic recipes such as insalata caprese, parmigiana di melanzane, courgette fritters, and squash ravioli with sage butter to more adventurous dishes such as tomato cappuccino. While Anna embraces classic Italian flavors, she ensures that the vegetable in the dish is at the heart of each recipe in her signature style. This is a celebration of vegetables that praises the flavor and texture of each individual root, squash, herb, and pulse to teach a new generation of cooks how to enjoy fresh seasonal produce at any time of year. Includes dual measures.